Explanation: There it is! The Cygnus supply ship was a welcome sight to the astronauts on the International Space Station just over a week ago. Launched three days before on a United Launch Alliance Atlas V from Cape Canaveral, Florida, the Orbital ATK's Cygnus spacecraft approached the International Space Station above the backdrop of a picturesque planet Earth. The Sun was setting off the image to the upper left, illuminating clouds well below the approaching vehicle. 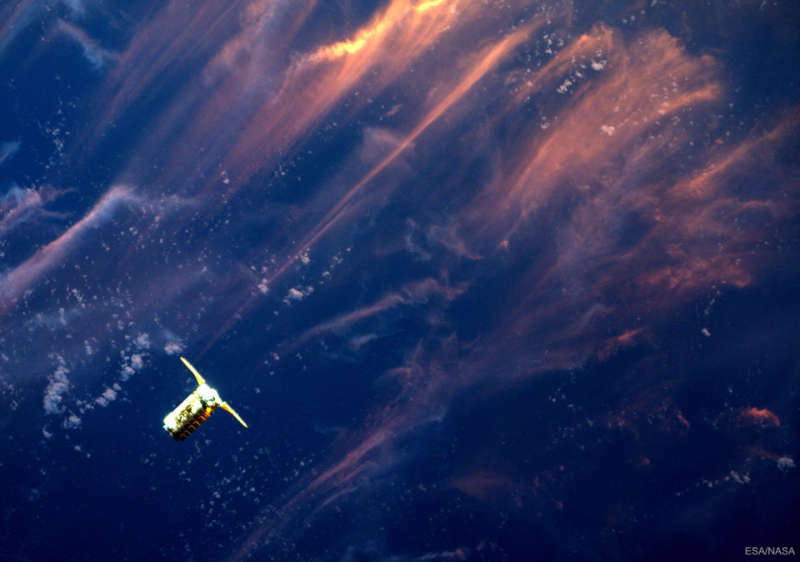 The robotic Cygnus spacecraft was captured first on camera and later with the space station's Canadarm2 by ESA's Flight Engineer Thomas Pesquet and NASA's Expedition-51 Commander Peggy Whitson. Commander Whitson, a biochemist, has now set a new American record for the most total days in space. Besides essentials, the Cygnus carried equipment to bolster over 200 science experiments being conducted on the football-field sized Earth-orbiting outpost.